The NFL Playoff conference championships are coming up this weekend, and the lineup looks about as predictable as could be. 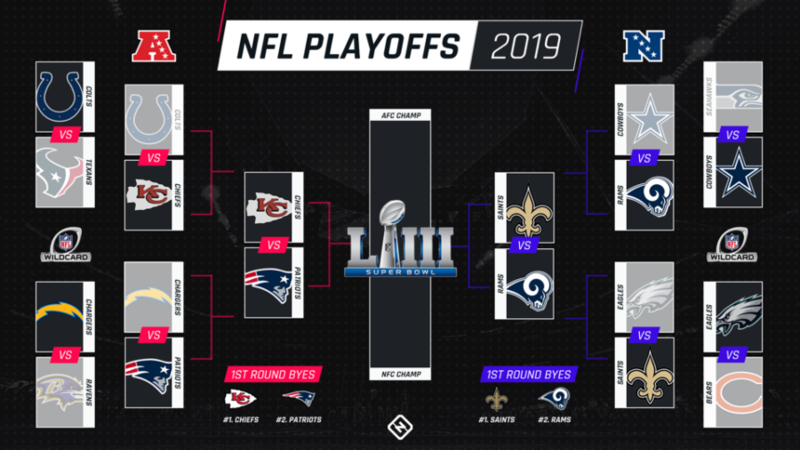 The top two seeds from each conference are competing to play in the Super Bowl, with the New England Patriots playing the Kansas City Chiefs in the AFC and the LA Rams facing the New Orleans Saints for the NFC title. This isn’t too surprising, really, as every number one seed has advanced to this round for the last six years- besides the 2016-17 Dallas Cowboys. However, just because the semi-finals of the playoffs show no surprises, this doesn’t mean there hasn’t been any drama in the postseason so far. Only one more round of football games stands before the Super Bowl on February 3rd. The teams playing for the championship will not be decided until this Sunday, but one thing’s for sure; two of the top four rated teams will advance no matter what happens. And with the biggest game of the season falling one week before Winter Formal, it will be a great time for everyone to sit down with friends and enjoy a great game of pigskin.